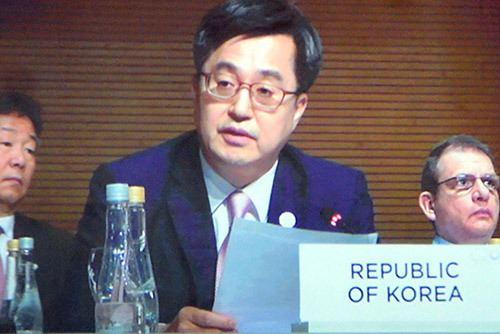 Finance Minister Kim Dong-yeon has called on countries around the world to further boost international cooperation to address global economic risk factors such as trade disputes. Kim made the call on Sunday during a meeting of finance ministers and central bank governors of G20 nations in Buenos Aires, Argentina. The minister stressed the need for stronger international cooperation, saying that each country may not have the sufficient capacity to tackle risk factors alone given that they are burdened with high government debts and low interest rates. He said if risk factors such as trade disputes, global imbalance and financial market uncertainty actualize, it will affect not only emerging economies but also a number of developed nations too. Kim emphasized that each country must minimize the negative effects its economic policies could have on other nations.